Every year I attempt to grow sunflowers. Quite often, the animals that live in my yard will dig up the seeds before they even sprout. I’ve stopped this natural tendency of the critters by sprinkling chili powder on top of the soil that covers the seeds. Even so, if they sprout, the tender green shoots are a delicacy to chipmunks, squirrels and rabbits, and when I’ve checked the progress of the sunflowers I find them nipped away and ruined. This year I’ve had a bit more success. 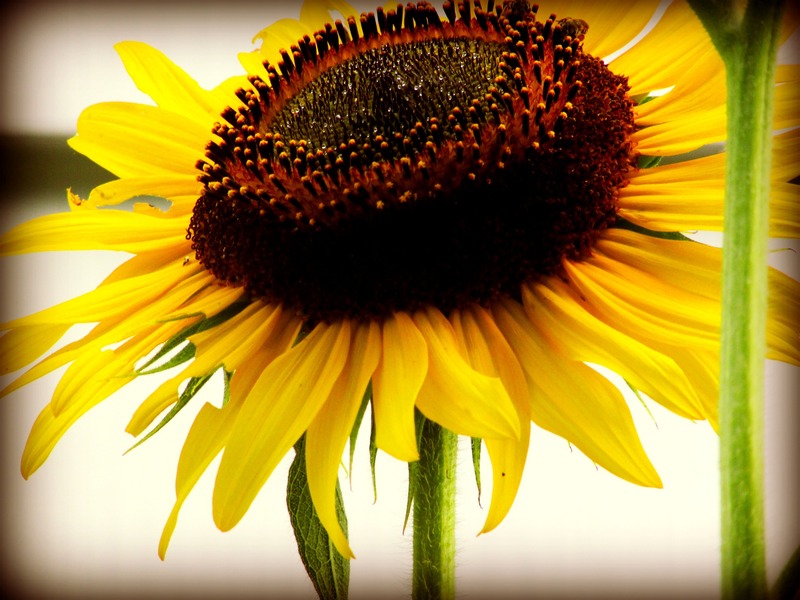 The sunflower in the photograph is growing outside my kitchen window. My husband measured it and the stalk was well over eleven feet. The plant is still growing and now has two blooms and many buds. So far, no adventurous squirrel has climbed to the top to bite away the buds and flowers. I owe my success in growing sunflowers this year to empty water bottles. 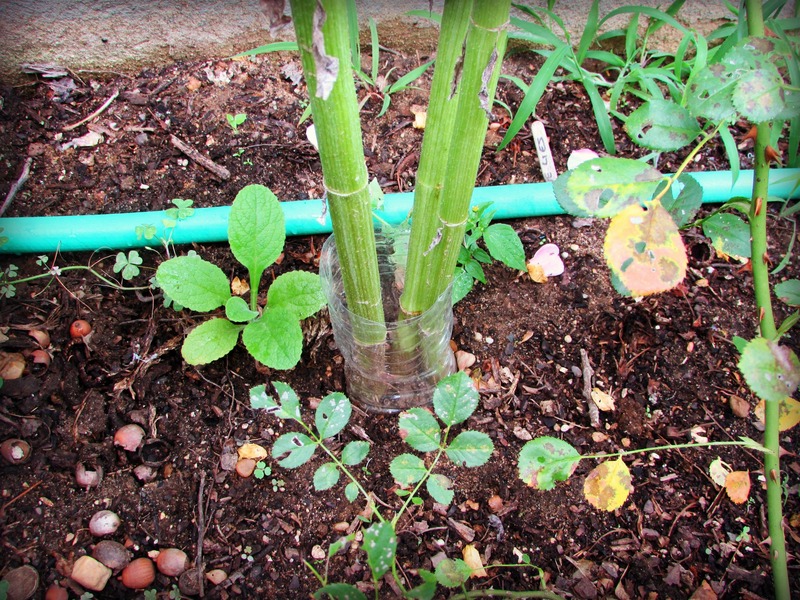 After the sprouts broke through the soil I placed a bottomless water bottle, with the top cut away, around the shoot. In a few gardens, as the sunflower grew, I added another bottle for more protection. (Bunnies are very good at standing up on their hind legs to reach the top of a tender plant.) 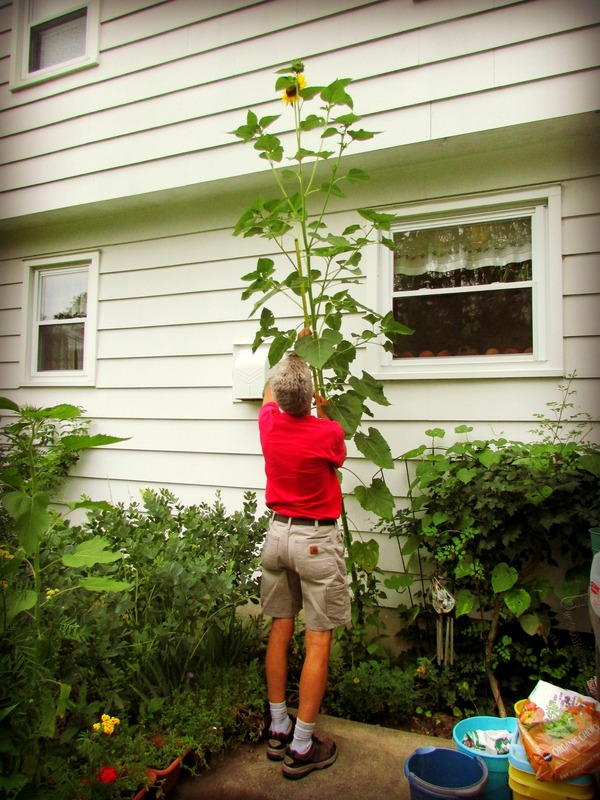 If you live in an area that stays warm through November, there is still time to plant a crop of sunflowers. I am growing sunflowers for the first time this year, and I am so pleased they took! They’re well over my head, but they haven’t opened all the way yet. Very exciting! I’m happy for both of us.